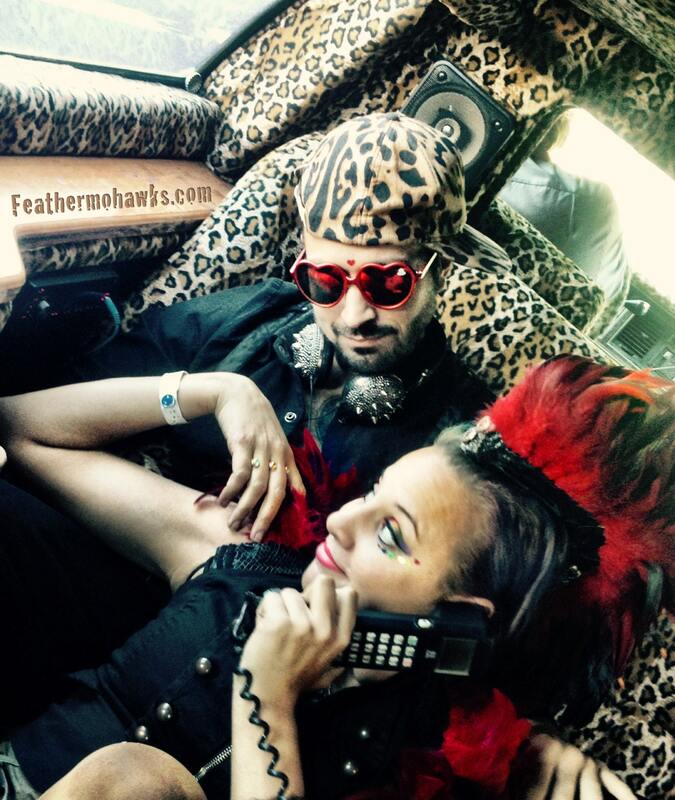 Rock out with your hawk out and feel like a God/Goddess in your hand made feather mohawk!!! There is a red shrug that you can purchase separately for an additional $100 - I have made separate listings if you are interested in purchasing both. The first time I put on my first feather mohawk, I instantly felt its power. I quickly realized I could not keep this all to myself. 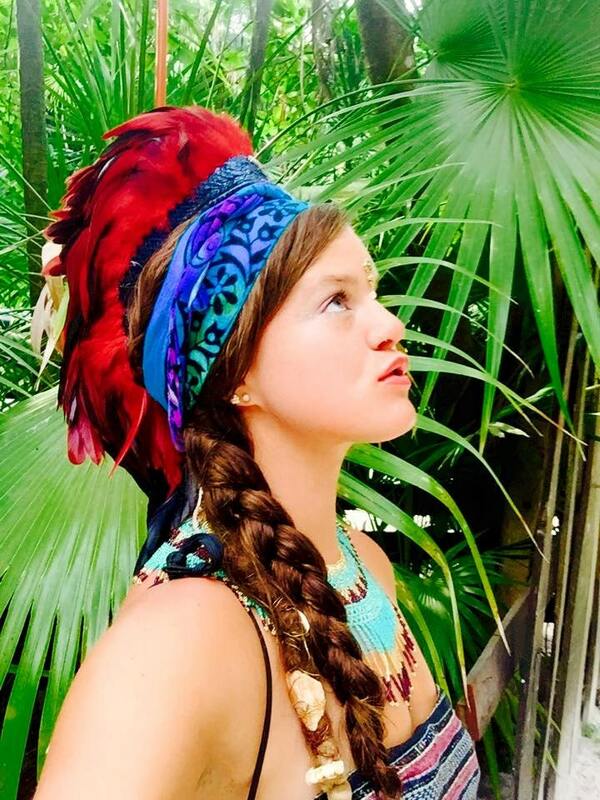 So now here's your chance to experience the power of one of my feather mohawks! I consider each piece to be a work of art and treat it as such. They are completely hand made by me with love from start to finish using scraps of real and faux leather, fabric and gorgeous feathers. I have a video available on instructions on how to wear them (link below) and anybody with at least 2-3 inches of hair on top can wear one! Each piece is entirely handmade with love by me, and includes an authenticity tag "handmade by Michelle Curiel" with the mohawk style and number on it. 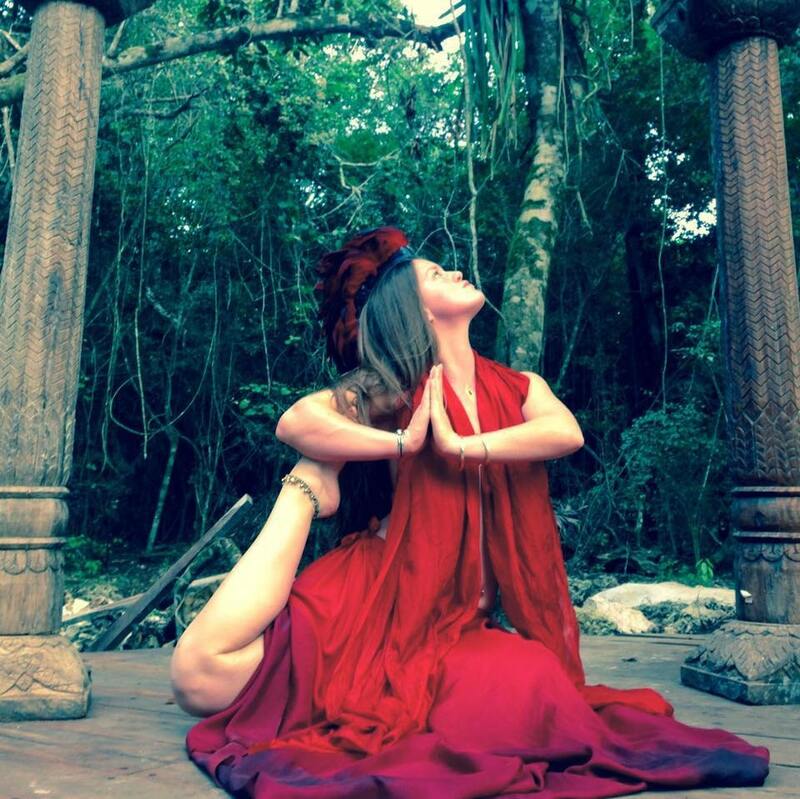 This is not only a headpiece - it is a work of art and treated as such. 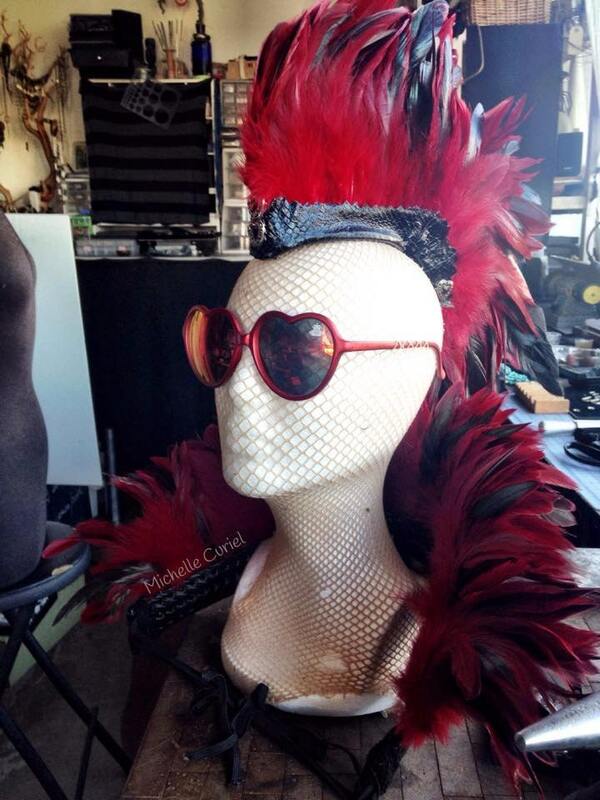 When not wearing your feather hawk, display it proudly in your home on a mannequin head or shadow box and get tons of compliments on it by your guests! CAN I CUSTOMIZE MY FEATHER MOHAWK? Yes! At your request, I will email you a photo of the exact one you will be getting before I send it out so that I get your seal of approval! Make sure to send me your email address when you order! Once it's on, you rest be assured that it will be on securely and comfortably - I've even forgotten that I have it on sometimes! Holds on tightly with a with a banana clip, hair ties and clips (included). No headband needed! This is something you can wear to a party and swing your head in any direction without feeling like it might fall off! FUN! I DON'T WANT IT TO FALL OF OF ME, CAN I REALLY WEAR IT ALL DAY AND NIGHT? I designed this feather mohawk so that they would stay ON! It's not just a for show piece, it is a piece that can literally be worn all day - I even slept in mine once...don't ask ;) If you follow the instructions on how to wear it and really secure it in place(super tight hair ties, extra hair gel!!! ), you should not have any problems with it falling off. MY HAIR IS SUPER SHORT, BUT I STILL WANT ONE!!! WHAT ARE MY OPTIONS? If you have 2-3 inches of hair: You can still wear this mohawk - watch the video http://www.youtube.com/watch?v=tvq6Bd4gF9Q, and to add to that, instead of just two hair ties, use three for extra security and make sure you use a heavy gel on your hair (hair glue works wonders!!!) on top so that the mohawk adheres to your head tightly. Bald/1 inch of hair: Because it uses a banana clip, it can be attached to a skull cap or Nylon cap. I can also add a headband that would go around your head to secure it in place. Let's talk! Please allow about 2-4 weeks for me to get it made for you and shipped out so you can rock this baby out on the town, party, rave, festival, carnival, mardi gras, photoshoot, concert, New Years Eve, Halloween - anywhere you want to WOW people and turn heads, this is what you need!! !